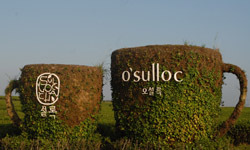 Tea enthusiasts from across Jeju travelled to the O’Sulloc Tea Museum near Seogwipo-si recently for the third annual O’Sulloc Green Tea Festival. The festival, aimed at celebrating and promoting Jeju’s largest tea producer, took place over 10 days at the beginning of May. One of the main attractions was the rare opportunity to pick one’s own tea from the plantation upon which the museum is based. Knowledgeable guides were on hand to help novice pickers in making a good harvest. After several minutes of picking festival-goers were invited into a large marquee to watch professionals drying the leaves and receive complimentary packets of O’Sulloc’s high-quality green tea. Activities for visitors included souvenir postcard making, a “tea roulette” game, digital snapshots and a bike ride through the tea fields. Perfect for enjoying and photographing the stunning rows of tea bushes stretching as far as the eye could see and the quiet serenity of the O’Sulloc grounds, many visitors took their time with this part of the festival experience. Once the outdoor activities had been concluded there was plenty to draw people inside the museum. 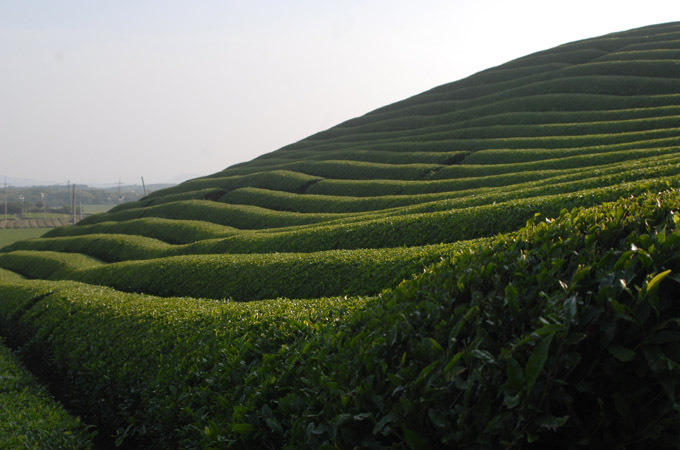 An open-air viewing platform at the top of the building offers an amazing panorama of the tea-growing estate and provides many more photo opportunities. Downstairs, the newly remodelled museum boasts a variety of cups and teapots dating back hundreds of years into Korea’s tea-drinking past and reveals the story of O’Sulloc’s 30 years of tea production. All the information offered alongside the exhibits is available in Korean and English and not only traces the history of tea in Korea but also gives a wider overview of teas place in global culture. Before returning home from O’Sulloc’s a visit to the gift shop and café is a must. A large selection of authentic gifts is available, including O’Sulloc’s own original green tea, unique blends such as ‘candy’ and ‘coffee’ flavoured tea, beautiful hand-made tea sets and the infamous Earl Grey tea cookies that are so delicious they rarely last the journey home. The tea café features green tea beverages and a creamy, green tea soft ice cream, in a lovely courtyard setting. O’Sulloc Tea Musuem and Plantation is located just off route 95 and well sign-posted. It can be reached in around 30 minutes by car from Jeju-si. Alternatively it is possible to take the bus bound for Moseulpo and then a taxi from Moseulpo to O’Sulloc’s. For anyone interested in tea and its place in Korean culture, the journey is a worthwhile and rewarding experience.